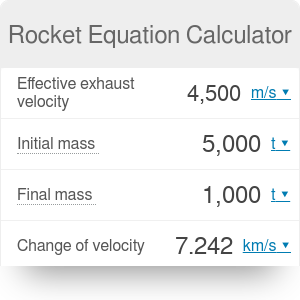 With this rocket equation calculator, you can explore the principles of motion of the vehicles that we call rockets. The first man landing on the moon took place in 1969 during a mission called Apollo 11. From that time, the basics of jet rockets remained the same. One of the simplest cases of the movement of such a rocket can be described using the Tsiolkovsky rocket equation (also called the ideal rocket equation). Read on if you want to learn more about it. Ideal rocket equation describes the motion of a device that can apply an acceleration to itself using thrust. Such a rocket burns the propelling fuel and simultaneously reduces its weight. Burned propellants are exhausted from the nozzle, and the rocket accelerates as the result of the conservation of momentum. Tsiolkovsky rocket equation should be used only in simple cases when no other external forces act on a rocket. In real motion, the rocket has to overcome both air resistance and gravity, which was taken into account by Tsiolkovsky in his further, more complicated, studies. mf is the final mass (rocket without propellants). The change of the velocity of the rocket Δv is the difference between the final and the initial velocity of the rocket. The effective exhaust velocity ve describes how fast propellants expel from the rocket. From the above equation you can see that the greater are ve and m0 (more propellant), the higher velocities you can achieve. You have probably seen many times that rockets consist of several parts that are rejected one after another during the movement of the rocket. When a particular part runs out the fuel, it becomes a redundant mass and should be removed. The change of the velocity Δv can be calculated independently for each step with our rocket equation calculator and then linearly summed up Δv = Δv1 + Δv2 + .... An essential advantage for this is that each stage can use a different type of rocket engine which is tuned for particular conditions (lower parts - atmospheric pressure, upper parts - vacuum). Rocket Equation Calculator can be embedded on your website to enrich the content you wrote and make it easier for your visitors to understand your message.